In this post we will study about different Types of Mountains which are classified based on various factors. This post will be helpful to answer location based questions. Orogeny (Geology) is a process in which a section of the earth’s crust is folded and deformed by lateral compression to form a mountain range. Orogenic movements are ‘Tectonic movements’ of the earth which involve the folding of sediments, faulting and metamorphism [Geology (of rock) that has undergone transformation by heat, pressure, or other natural agencies]. the Himalayas, the Satpura, and the Maikal of India. Oceanic mountains are found on continental shelves and ocean floors. If the height of the mountains is considered from the ocean floor, Mauna Kea (9140) would be the highest mountain. A total of nine orogenic or mountain building movements have taken place so far. Some of them occurred in Pre-Cambrian times between 600-3,500 million years ago. The three more recent orogenies are the Caledonian, Hercynian and Alpine. They belong to the Pre-Cambrian period, a period that extended for more than 4 billion years. The rocks have been subjected to upheaval, denudation and metamorphosis. So the remnants appear as ‘residual mountains’. 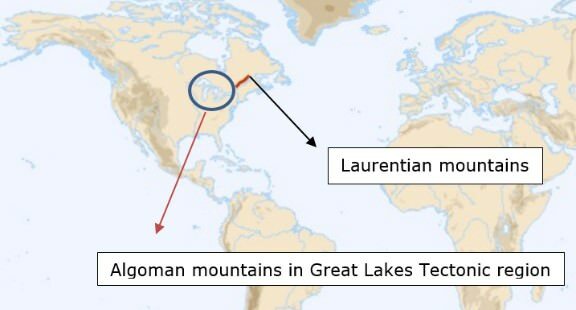 Some of the examples are Laurentian mountains, Algoman mountains. They originated due to the great mountain-building movements and associated tectonic movements of the late Silurian and early Devonian periods. Caledonian mountains came into existence between approximately 430 million years and 380 million years ago. 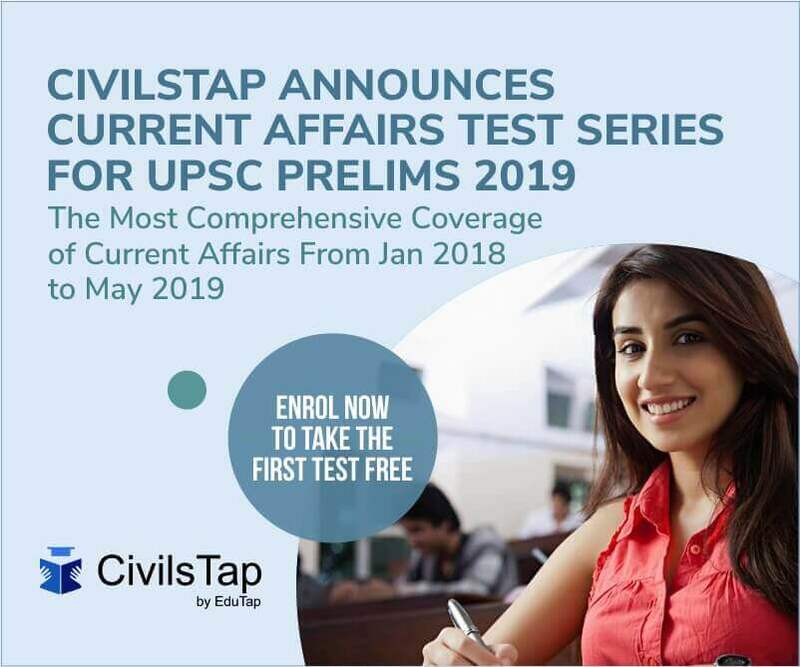 Examples are the Appalachians, Aravallis, Mahadeo etc. 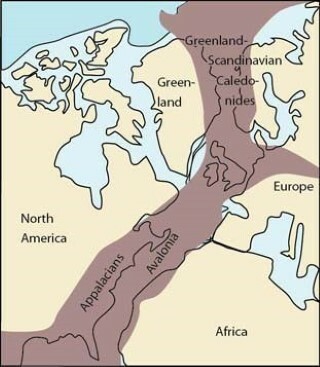 These mountains originated during the upper Carboniferous to Permian Period in Europe. Hercynian mountains came into existence between approximately 340 million ears and 225 million years ago. Some examples are the mountains of Vosges and Black Forest, Altai, Tien Shan mountains of Asia, Ural Mountains etc. Has its origin in the Tertiary Period which consists of the Palaeocene, Eocene, Oligocene, Miocene and Pliocene epochs. The mountains were formed from about 65 million years to 7 million years ago. the Himalayas of the Indian subcontinent in mountains radiating from Pamir knot like Pauntic, Taurus, Elburz, Zagros and Kunlun etc. Being the most recently formed, these ranges, such as the Alps, Himalayas, Andes and Rockies are the loftiest with rugged terrain. Original or Tectonic mountains are the product of tectonic forces. 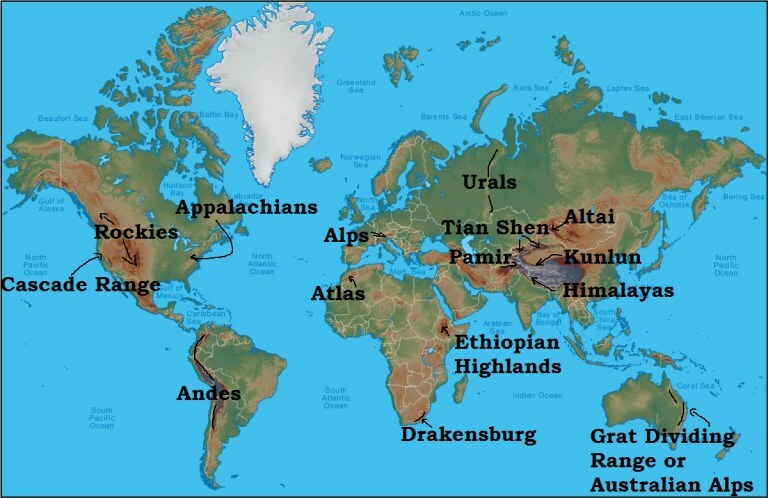 The tectonic mountains may be categorized into fold mountains (Himalayas, Rockies, Andes etc. 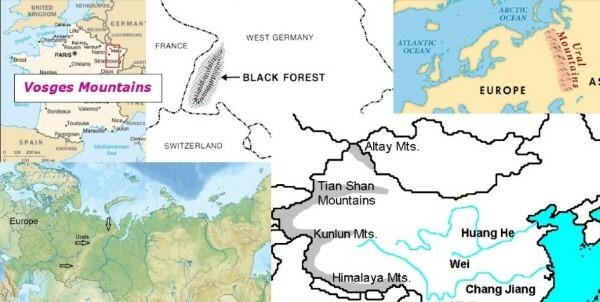 ), block mountains (Vosges mountains in France, Black Forest in Germany, Vindhya and Satpuras in India etc.) and volcanic mountains (Cascade Range in USA, Mount Kenya, Mount Kilimanjaro, Mount Fujiyama etc.). Circum-erosional or Relict or Residual mountains (Aravalis in India, Urals in Russia etc.) are the remnants of old fold mountains derived as a result of denudation [strip of covering or possessions; make bare].